It’s the 20th, which means another DD/DDA Challenge! 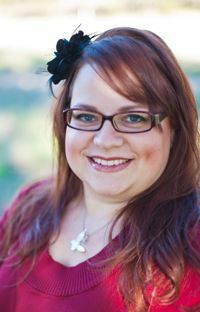 This month Sharon was the hostess and she came up with a lovely challenge! It just had to include a heart! She’s so nice, she didn’t even give us a restriction! Challenge Focus: create a hostess thank you card or gift, Thanksgiving card, treat holder, table favor or placecard, or Thanksgiving home decor item. I’ve had this blank clip board for a few months, I picked it up at Michaels some time ago. I’ve been wanting to create something for the house that would utilize this as a place for us to leave little notes for each other. I thought it would be nice to have something like this to help encourage us to say “thank you” to each other for the big and little things.It was easy enough to complete. I began by taking off all the hardware then painting it white. I then cut strips of paper to fit the different sized panels, sanded all the edges, adhered the ric rac with craft glue, then reattached the hardware. For the sentiment, I used a plate to trace the semi circle on the kraft paper. I then faux stitched inside the outline before cutting it out with wide scallop scissors. I had some left over letters from a previous project I did, so I used those for the sentiment. 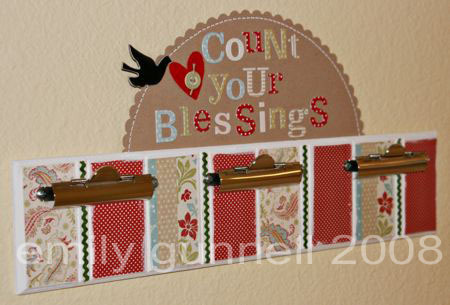 “Count your blessings” is a favorite church hymn of mine (I have several favorites). This one always tends to lift my spirits and it’s one that I really enjoy singing. I cut the felt heart out with my Cuttlebug and heart die, then attached the button with twine. I had to add a bird, since I’m married to Don, so I simply roughed up the edges before adhering it with foam tape. I then used my super sticky tape that I get from Taylored Expressions to adhere the sentiment behind the clip board. Now we have a cute place to leave notes of thanks during this month of Thanksgiving, as well as all year long. Oh my goodness Em! This is so darling! ACCCKKK! I love it! How could I have not seen this before now?! It’s fabulous and now on my To-Do List to create!